How does your manager recognise excellent practice? A handwritten note is among the ways that chief nurse Carolyn Fox lets staff know they are doing a great job. While the organisation already has some well-established ways of acknowledging the contributions of its staff, Ms Fox plans to introduce more this year, including the international Daisy Foundation Awards for extraordinary nurses. She also wants to introduce the Cavell Star Awards, which are for nurses, midwives and healthcare assistants who demonstrate exceptional care to colleagues, patients or patients’ families. ‘We often focus on the extraordinary, but we also have people who turn up day in and day out and deliver great care. They should be recognised too,’ says Ms Fox. She now wants to build on the trust’s strong foundation. 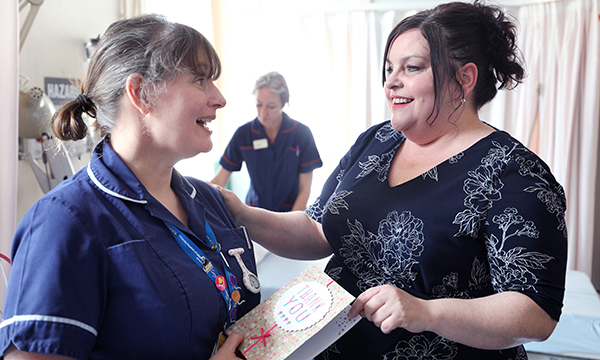 ‘I’m trying to encourage nurses and midwives to recognise each other’s contributions, fostering a culture where people can say “you did a great job today” to a colleague,’ she explains. In her previous role, Ms Fox was instrumental in Northampton General Hospital becoming the first NHS hospital in the UK to sign up to the internationally recognised Pathway to Excellence programme. What is the Pathway to Excellence? Later this year Ms Fox plans to introduce the programme for Leicester’s 5,000 or so registered nursing and midwifery staff, as part of the trust’s overall quality initiative. Ms Fox shows her appreciation with a hand-written card for ward sister Julie Godrich. She also wants to introduce a shared decision-making and governance model, adding to the trust’s existing good practice. ‘The nearer decisions are made to the patients and the front line, the bigger the impact they can have,’ says Ms Fox. The Pathway to Excellence programme originated in the United States, and Ms Fox has faced questions in the past about introducing it to the UK. But she says it is now an international programme, ‘which makes you feel part of the global nursing family’. Earlier this year the trust joined forces with four other health and social care providers in a large recruitment campaign. Your Future is hoping to attract nurses, doctors, health and social care professionals to work in hospitals, hospices and communities across the county. Other organisations taking part are Leicestershire Partnership NHS Trust, LOROS Hospice in Leicester, Rutland County Council and Leicester City Council, who between them have a workforce of 38,000. 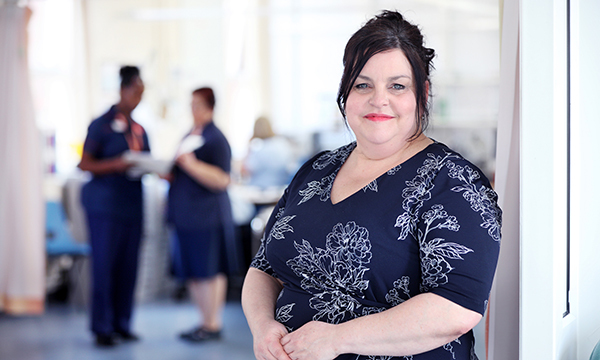 While the programme may be perceived as nurse-centric, Ms Fox believes it has huge organisational advantages, including improving the recruitment and retention of staff. ‘That was the evidence from my previous role, and it’s one of the reasons why I’m so keen to introduce it here,’ says Ms Fox.